Natural Lifemanship’s TF-EAP™ incorporates both ground and mounted work in very intentional ways that are unique to NL. We therefore have developed some specific language around how we work with the principles in the round pen and on the back of the horse. Anytime we talk about ground work, we are referring to Relationship Logic™ and whenever we talk about mounted work, we are talking about Rhythmic Riding™. Ground work is where any healthy relationship begins. If one hasn’t laid the “ground work” for a relationship based on honesty, trust, respect, and understanding, then the relationship is being set up for ultimate failure. If the foundation is not built correctly, each subsequent stage of the relationship will suffer. Setting the “ground work” allows the relationship to be built sequentially. This is easily demonstrated, understood, and practiced in a relationship with a horse. For instance, touching a horse before the horse has invited you to touch it will damage rather than strengthen the relationship. The damaging results may not be felt immediately, but as the relationship progresses, a lack of trust and respect will develop. Developing the relationship first on the ground allows the client to experience the effects of how they have built it before they have advanced to the stage in which they are most at risk of being hurt, both physically and emotionally. This stage is on the back of the horse, and this level of intimacy is the place of greatest risk and also often greatest reward. Although trained horses may already be “safe” for the client, an essential goal of TF-EAP is that clients develop a strong sense of personal relational safety and thus the process must progress at a pace that allows trust to be genuinely built before risks are taken. Equally important, however, is for clients to eventually be willing to be vulnerable and engage in appropriate intimacy when mutual trust and attunement have developed in a way that makes it safe and appropriate to do so. At this point, Relationship Logic will often proceed on the back of the horse. In this way, the most poignant work often occurs on the ground as the relationship progressively moves toward greater intimacy, which often but not always occurs on the horse’s back. Unlike some models, we have chosen to incorporate horseback riding into Natural Lifemanship. However, we use mounted work to address very specific therapeutic issues. We do not use riding for recreation, to get “buy in” from the clients, or with a primary goal of teaching horsemanship. The intervention of horseback riding has three overarching purposes and it is used to meet those purposes in very specific ways. Sometimes we use riding to prepare clients to be able to engage in Relationship Logic. In these cases, clients are initially so dysregulated that they cannot safely or productively do the work on the ground, which requires some level of perseverance and impulse control. Horseback riding provides the rhythmic, patterned, repetitive movement needed to reorganize and heal the brain on a cellular level, to help clients learn to self-regulate, and to allow them to further recognize relationship patterns and deepen intimacy. We use riding only when it will be more effective and efficient than anything that can be done on the ground. The same principles that drive Natural Lifemanship when done on the ground are applicable and even intensified when on the back of a horse. Studies show that functionality of the brain in people who have experienced trauma such as abuse, neglect, combat, or natural disasters is often compromised due to disorganization of connections in the brain. These people often struggle with emotion and impulse control, which results in the inability to appropriately handle even minimal stress. Natural Lifemanship utilizes the rhythmic, patterned, repetitive movement inherent in riding a horse to increase and reorganize the connections in the brain, thereby increasing the brain’s ability for emotion and impulse control. The horse is able to provide the rhythm required to effectively heal the traumatized brain until the client is able to independently provide that rhythm. In effect, clients passively learn to self-regulate through the use of the rhythmic, patterned, repetitive movement of the horse. In addition to providing the rhythm necessary to self-regulate, riding also provides a medium through which clients can learn the skills necessary to self-regulate. Riding is utilized to teach stress and emotion management skills and relaxation techniques. Many therapists teach these same skills in the context of a counseling session when the client is in a relative state of calm. They then discuss with the client how to use these same skills in more stressful situations. In Natural Lifemanship, we use horses to provide a safe, yet mildly stressful environment in which to practice these skills. Before the horse will appropriately control himself, the client must first be in control of his/her own thoughts, emotions, and actions. Many clients live in chaotic, dysfunctional environments, and riding helps them realize that in order to control the chaos around them, they must first control the chaos inside them. Many clients are unable to do deeper, insight-oriented therapeutic work until they are able to bring their level of arousal to a place that allows them to gain and retain insight, and benefit from higher level learning. This level of regulation is most profoundly learned on the back of a horse. The most intimate and vulnerable a person will ever be in a relationship with a horse is on their back. Horseback riding requires a higher degree of trust than groundwork from both the human and horse. This is where the greatest potential for conflict in the relationship lies. The nature of relationships is that the place with the most potential for reward is also the place with the most potential for loss. With a horse, this place is on his back. When building a relationship with a horse, if this place of intimacy is forced before each party is ready, it will damage the relationship and have the potential for emotional and physical pain. However, healthy relationships are always moving forward in some way. If the horse and human reach the point where it is time to take the next step, and either party is unwilling, the relationship will suffer. When clients try to move toward this level of intimacy too quickly, there are consequences, and poignant therapeutic work abounds. The same opportunity exists when the client is unwilling or fearful of moving to this level of intimacy. In either situation this is a pattern that causes problems in their relationships. Therefore, riding, when it is appropriate, is a very important part of the therapeutic process. In Natural Lifemanship one of the most important interventions we use is helping the client find safety in every situation. 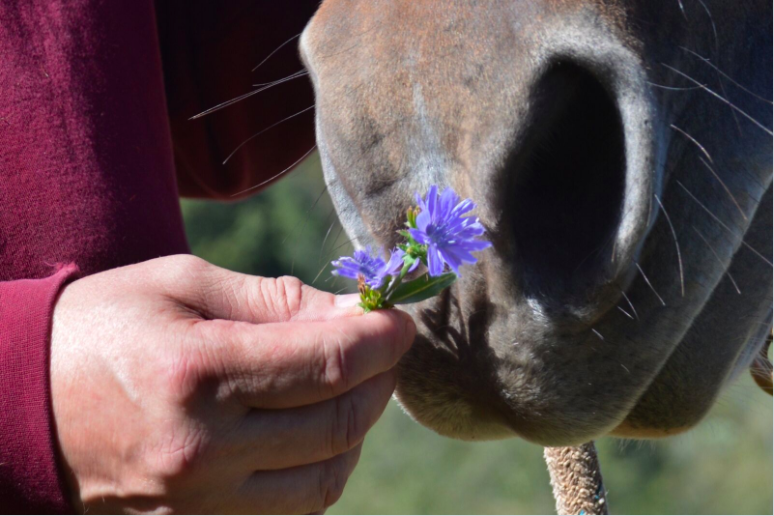 The safety the client finds with the horse during sessions is eventually transferred to other life situations with the help of the facilitators or the therapeutic team. This can evidence itself as physical and/or emotional safety. It is imperative that the client is allowed to find their own safety rather than having safety rules dictated and enforced. Safety in these sessions looks very different than safety in traditional horsemanship or therapeutic riding where the goals and desired outcomes are different. It is imperative for stabilization, growth, and healing that the client learns to take full responsibility for their own physical and emotional safety and the choices that they make. It is through this process that they are also able to let go of a false sense of safety and control, and begin to embrace an authentic sense of safety and security. In Natural Lifemanship the team does not dictate or enforce hard and fast rules. Choosing to indiscriminately not trust someone because of the possibility of getting hurt is damaging when transferred to other situations and relationships. In the same vein, not understanding the possibilities and making informed decisions can also be damaging. Many clients need to regain trust in themselves to make the appropriate decisions about their safety and the safety of others. In a relationship based on trust, respect, and understanding there is no place for hard and fast arbitrary rules. The foundation of this work is built on the relationship between the client and their horse. The principles that make this relationship healthy, will work to make all of life’s relationships healthy.